The Pewter Iris Cremation Urn is truly exquisite. 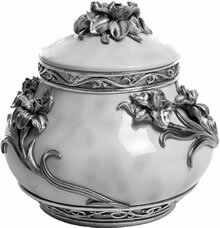 The urn is made of cold cast polystone with a hand-painted marble finish and beautifully detailed, hand-crafted pewter irises wrapping around the urn. The urn cavity is easily accessible from the top by a removable lid. The diameter of the opening is about 3 1/2 inches. The lid can be temporarily sealed with QuakeHold or museum putty, or permanently sealed using any household epoxy such as Krazy Glue or Gorilla Glue. Measures 6 1/2" x 6 1/2", with a volume of approximately 60 cubic inches. Appropriate for a small pet or child weighing less than 40 pounds, or for families who are sharing the cremains of a loved one.